If I were you, and I frequented this blog, I would have a huge question mark in my head as to why Carrie of Reading to Know was featuring Life Lessons from a Horse Whisperer on her site. Ok, I'm not a horse person. An "animal person" I may be - barely. I think animals are cute and I like to look at them (most of the time) but when it comes to caring for an animal, well, I'd probably choose to pass on the option, but thanks for asking. And can you please ask your dog to stop licking my hand? Thanks. The idea of riding a horse is appealing to me, but I don't have enough drive to really want to do it. I've gone horseback riding on the beach before but I was stuck on a horse named Diablo if that tells you anything about the experience I had. It wasn't enough to scare me but it was enough to tell me I didn't care about riding horses that much. It's a fun idea - in theory. If Jennifer saddled a horse up for me and told me to get on it, I would (and happily.) Otherwise, I'd consider it on a case by case basis. Still, I'm friends with an amazing number of people who love animals in general and horses in particular. So when I was offered a chance to review Life Lessons from a Horse Whisperer I went ahead and took it, planning to read it and then ask my friend Sky, my most famous horse loving friend, to read it also and share her thoughts. 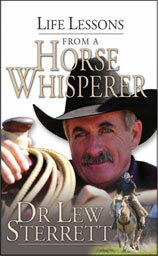 Hopefully this way you could get an idea of how the book read from a non-horse person as well as a horse enthusiast. Is it sad to tell you that one of the most intriguing things about the book, to me, was the fact that it was endorsed by the President and COO of Chick Fil A? That might be admitting too much to you, dear reader, but nevertheless, I was pretty impressed! "This is more than a book about horses, as one might suppose. It is a story about life and hope: hope that prevails in the unknown, hope that prevails in adversity, and hope that prevails even through death itself. It provokes the question of how hope can prevail and on what basis. It is possible to have hope, even joy, amidst great trails in life? The essence of this story is to look of life's perplexing circumstances through the eyes of a horse." I can get behind that idea, for sure, and certainly his message of hope comes across in the book. But I just kept thinking to myself, "Man, this guy really loves horses." Dr. Lew Sterrett combines the lessons he has learned from working with horses to the things God has taught him in his life. One of the points I personally benefited from in Life Lessons from a Horse Whisperer is that there are two kinds of horses, 'want-to' and 'have-to'. Working with a want-to was easier because they were so willing to please. Working with a have-to was more difficult because they will only be doing bare minimal of what you are trying to teach them. I thought this applied directly to children as well! You have ones who want to please you and try very hard to obey the rules and create harmony, and then you have the child who only does what he has to. He doesn't care about the greater picture, he doesn't want to be a part of anything but his own desires. This also applies to Christians! How many of us obey God's Word because we have to, instead of because we want to? Horses have a natural fight or flee instinct, this means that when something unknown and potentially hazardous comes up they either strike out blindly, fighting with every fiber or they turn around and run madly in the other direction. He describes several instances in his book where his horse Spark listens to his direction instead of his natural horse instinct and because of this communication they were able to safely get out of possibly dangerous situations. So when life throws an unknown hazard at us how are we, as Christians, supposed to react? Well, we should stand firm and wait for God's guiding! 1. You have to change the horse's beliefs, selfishness limits their potential to overcome obstacles. 2. The horse has to choose every day whether they are going to follow their trainer's guiding or remain inwardly focused. Hmm, sounds like a Christian's plight again doesn't it? We have to learn to believe in God instead of ourselves, we have to learn to trust His calling in our lives. The stallion is described by Dr Sterrett as "ruled by his emotions, he'll never reach his full potential, or be able to think clearly in a crisis, or when another horse is losing his mind. Once they have control of their emotions and can look to me - that's a different story." Jesus will not only cover our needs, but He leads us to rest. 2. Prepare people for change, don't spring it on them. 3. Correct people in private, not in public. 4. Deal with conflict immediately. I think this not only applies to our relationship with other Christians but our spouses and our children as well! While this book is mostly a journal of one man's walk with God and horses, I believe that anyone could benefit from reading it. It definitely made me think about the way I react in situations, and reminded me that I do have a fight or flight instinct, whereas I need to stand still at look to my Master to give me direction. So, what do you think? Lover of horses or not, I think there are some valid and good reasons to give this book a perusal myself. I might not have walked away with as much as Sky did though. That said, it was fun to share the book with my friend and catch her thoughts on the subject matter! Thanks, Sky, for your input! Sounds like a cool book. And, no I am not surprised that the Chick-fil-a endorsement impressed you the most. LOL! Having trained my first horse 14 years ago, I can tell you the authors points are worth while. Thanks for the book review ya'll. Thanks for asking me, I enjoyed reading it and reviewing it! PS I saw a Chic-fil-a in San Diego and took a picture on my phone because it reminded me of you! Thanks for the team review. I think I heard this gentleman on NPR once, and his ideas sounded interesting. This must be the book that goes along with them!